I don’t know about you, but I am always on the lookout for easy, nutritious recipes, especially at harvest and planting time. Just the other night, I hit the jackpot. Chicken jalapeño popper pasta. Even my farmer loved it. Bonus for all you farm wives out there, I made this a week ahead and froze it until we needed it, AND I was able to use up some of my garden-fresh jalapeños. So easy and so delicious! In a large mixing bowl add cream cheese, bacon, 1 cup cheddar cheese and jalapeños. Mix well. Stir in cream and half and half. Spread bread crumbs over pasta (optional). Bake at 350 degrees F for 40 minutes. Remove from oven and sprinkle remaining cheese over the top and return to the oven for 5 more minutes. Hope you all are having safe harvest season! As we speed towards Thanksgiving at 80 mph, it’s easy to lose sight of the important things in life. Things like deadlines and all that is wrong in the world fog our minds as we race to the next commitment on our to-do list. After that, we start fretting about coordinating family Thanksgiving – who’s coming, who’s making what, etc. But you know what, in the big picture, it doesn’t really matter because today we are blessed. Truly blessed. We have a family who loves us through anything, friends who know when you need a heaping pile of cheesy fries, and farmers who produced that heaping pile of cheesy fries. So as we speed towards another Thanksgiving, lets all count our blessings instead of comparing apples to apples. I bet you’ll have a much more enjoyable day! And what’s a Thanksgiving post without some of our favorite recipes? I mean talk about getting in the spirit! What do you do with all your leftover turkey? 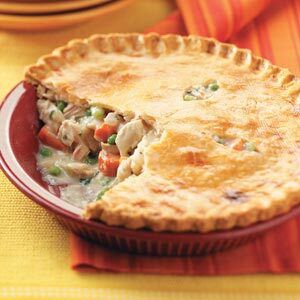 Make turkey pie of course! For the crust: Mix shortening, flour, and salt until crumbly. Add water using mixer with dough beaters. Roll out for 9 x 13 pan on floured board, put in bottom of pan. Any extra dough store in ziplock in refrigerator. Good for a few days or make into a pie for dessert. For the pie: Put ingredients evenly spread out not the crust that is on bottom of the baking dish. Heat and thickness the chicken broth to gravy consistency with flour. Pour over ingredients. Put on top crust adhere sides and corners to the bottom crust with a little water if necessary. Cut several small slits in top of crust to prevent dough from bubbling up. Sprinkle top crust with salt, pepper, and onion salt. Bake at 350 until crust is done. And one more for all you sweet-tooths out there. 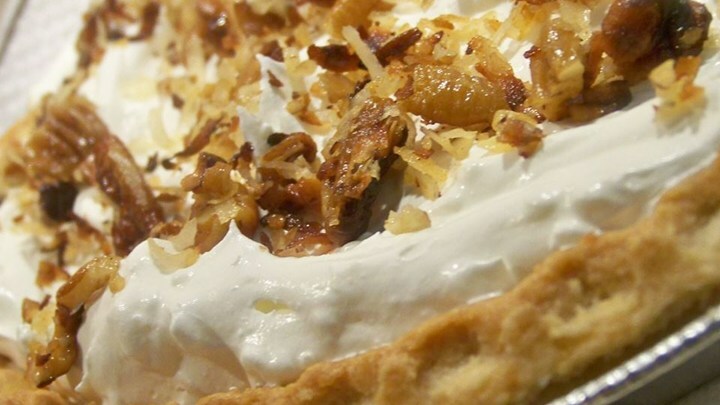 Caramel-Coconut Pie comes highly recommended. Melt butter in large skillet. Add coconut and 1/2 c pecans; cook until golden, stirring frequently. Set mixture aside and let cool slightly. Combine cream cheese and sweetened condensed milk; beat at medium speed of an electric mixer until smooth. Fold in whipped topping. Layer 1/4 of cream cheese mixture in each pastry shell. Drizzle 1/4 of caramel topping over each pie. Sprinkle 1/4 coconut mixture evenly over each pie. Repeat layers with remaining cream cheese mixture, caramel topping, and coconut mixture. Cover and freeze pies at least 8 hours. Let frozen pies stand at room temperature 5 minutes before slicing. Garnish with pecan halves, if desired. So what’s your favorite Thanksgiving recipe? Leave it in the comments!